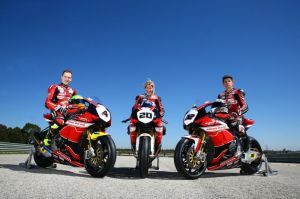 Following the winter break, the Honda Racing British Superbike trio will reunite in Spain next week as the team kicks off an extensive pre-season Superbike test programme aboard the Honda CBR1000RR Fireblade. Dan Linfoot, Jenny Tinmouth and Jason O’Halloran will start the programme with a five day test in Monteblanco, before travelling to Almeria on 14-15 March for a further two days. The team will then return home to continue development ahead of the official British Superbike Championship tests at Silverstone and Donington Park at the end of the month. Monteblanco will be the first time all three Honda riders have been on-track together since last August, when O’Halloran’s championship hopes were dashed following an accident at Thruxton, which ruled him out for the remainder of the 2015 season. Now fully fit, the ‘O’Show’ is ready to get back on a Superbike after a successful shakedown test in January aboard his 2014 race-winning Honda Superstock machine. Meanwhile Linfoot and Tinmouth have enjoyed a busy winter with intensive training programmes in preparation for their assaults on the British Superbike Championship. The first round of the 2016 MCE British Superbike Championship takes place at Silverstone 8-10 April. The team are really looking forward to returning to the track after the winter break. The mechanics have been working hard with the development of the three Fireblades and I know that the riders have been training hard in preparation for the season. Jason really impressed us all in January on the Superstock machine; his lap times and bike fitness were encouraging considering it was his first time on a bike since the accident last year. Meanwhile Jenny enjoyed time on her own Honda race bike last week, getting a few laps in at Almeria and Dan’s been cracking on with his training. I’m looking forward to seeing how their hard work will translate when they get back on the Superbikes for this testing programme. I’m excited to get back on two-wheels and get testing next week, it’s been a long winter break and I just can’t wait to get going now. The guys at the workshop have been working hard on all three CBR’s so I’m looking forward to getting down to the serious side and seeing the new ideas and changes on-track. We have a good programme to work to in Spain, with two days on-track, a day off, then two days back on-track. We then have the weekend and travel to Almeria for a further two days to get the feel of the bikes at a different track. I’ve been busy all winter working on my fitness, I have been out on the MX bike and also pit biking but I can’t wait to get back on my Superbike and get started with the BSB season. I’ve been working hard and training to prepare for this season over the winter and have been out on my mountain bike a lot, exploring Wales, which has been mega, but I am looking forward to getting back on the Superbike next week now! It’s great as I’m walking back into the same team so we can get started straight away, as I know the Fireblade and the team, so we can pretty much pick up from where we left last year. I’m happy to be back with the Honda team for another year, I learnt so much last year and happy I broke a lot of personal lap records, so for 2016 it’s all about putting what I learnt into practice and working my way up! I’m looking forward to getting our pre-season testing underway and getting back on the Superbike! I’ve just got back from Australia where I’ve had a month re-charging the batteries and just getting away from it all. After five months of intensive rehab it was nice to get home and chill-out, as well as focusing on my training and fitness. I went to Cartagena in January on the Superstock Fireblade and left there really pleased with the progress we made in those two days on-track, and shouldn’t be too far away from where I left off last year. It also helps that I’m back with my old crew, the Fireblade is the same so I don’t have to re-learn anything, just get back on and get cracking. I enjoy all the pre-season building work with the team and getting the bike ready, but I am keeping a firm eye on Silverstone.